The jellyper family is a family of species that appears in Hey! Pikmin only. So far, this family is made of one species, the Grabbit. The Grabbit is a green creature, with big red eyes, two small wings and four legs. 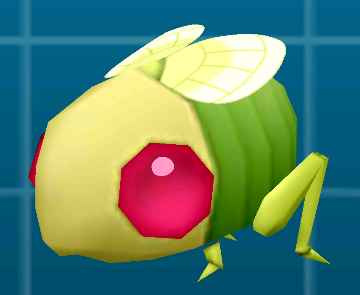 This creature spends its time jumping, but can kill Pikmin if it lands on one of them. Aside from that, this creature is inoffensive. "Jellyper" has "lyper" in it, which sounds like leaper. This is because of members of the family's ability to leap very high. The name also has "jelly" in it, because gelatinous objects have bouncy properties. This is also because members constantly leap, or bounce forward. This page was last edited on April 15, 2019, at 16:27.